Tendering - Despite having cruised several times, this was my first experience with tendering into a port. The boats used for tendering were large, double decker vessels that helped to transport people pretty quickly. We had purchased Faster to the Fun (FTTF) for our cruise and I think the best benefit of it was the priority tendering. With FTTF, we were on the first tender over to Half Moon Cay allowing us to have first choice of where to set up on the island and maximizing our time there. If you don't have FTTF, you need to go to Lido deck in the morning and grab tender tickets which will tell you which boat you take to your day in paradise! 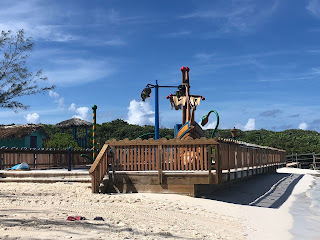 The Pirate Ship Water Playground - Perfect for Kids! The Beach - Simply perfect! The sand is soft and there are lots of beach chairs available all along the beach. When we got to the beach we turned left and went to the end of the row. 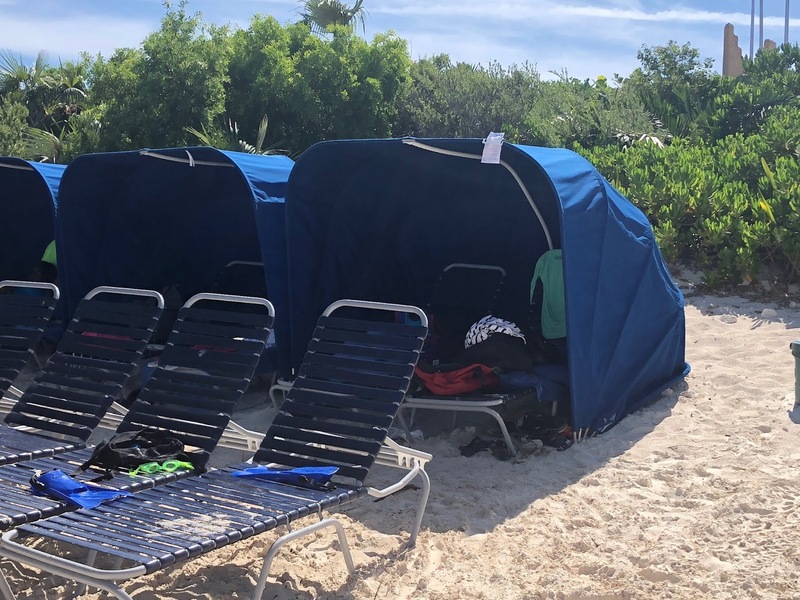 We were able to purchase a clam shell for $25 that was basically a tent that covered two beach chairs to provide shade. We also grabbed the two beach chairs in front of it for our family. If you are interested in grabbing a clam shell, go to the blue beach rental hut as soon as you arrive - qualities are limited and they can't be reserved ahead of time. Our spot was great as it was right next to the pirate ship water playground. With young kids, they were able to run to the playground, play in the sand, and jump in the water all with us watching from one easy location! A favorite mom travel tip - purchase some sand toys from the dollar store before heading on vacation. 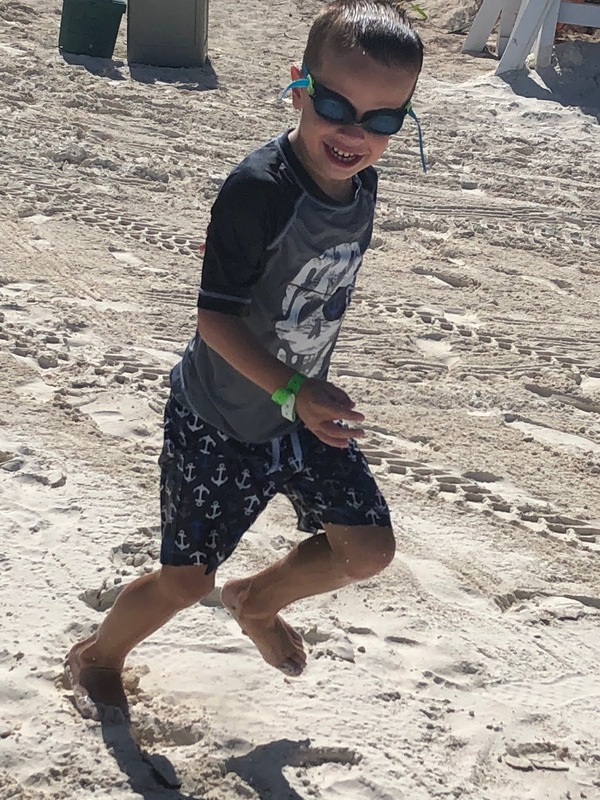 They are small enough to pack and will keep the kids entertained on the beach without breaking the bank and purchasing them while on vacation. I have to say though my favorite part of the day was simply floating in the water! A view of the clam shells available for rent. Food and Drink - Carnival provides lunch included in your cruise fare while on the island during a set lunch time. The food is served buffet style and features typical "cookout" food - burgers, hot dogs, chicken, chips, various salads, fruit, and an assortment of desserts. Just like on the cruise ship, water and lemonade are included but you have to pay for sodas or alcohol. 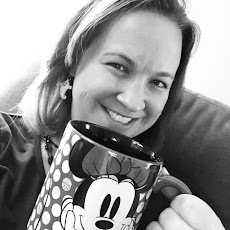 It's also important to note that the Cheers and Bubble packages don't work on Half Moon Cay so you will be paying for each individual soda or adult beverage. Prices for drinks were comparable to on the ship. Smiles like this are what vacation is all about! Excursions - We didn't book an excursion on Half Moon Cay. In fact, I have never booked an excursion on a cruise line's private island simply because the islands themselves are usually so beautiful that I want to soak up the day enjoying the beach. However, the option to book excursions exists if you're looking to add some excitement to your day. There are also cabanas of various sizes available to rent if you want some more privacy while on the island. This was probably one of my favorite days of the cruise and I hope we have the chance to visit again soon!